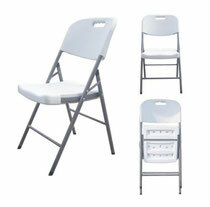 Folding chair is a light, portable chair that that folds flat, and can be stored in a stack, row, or on a cart. olding chairs are generally used for seating in areas where permanent seating is not possible or practical. This includes outdoor and indoor events such as funerals, college graduations, religious services, and sporting games and competitions. They are often used as weapons in professional wrestling. Folding chairs were already being used in Ancient Egypt, Greece and Rome. The frame was mostly made of wood, and seldom made of metal. The wood was inlaid with artistic carvings, gilded, and decorated with ivory. In Northern Europe, folding chairs return to the brass age. The folding chair became especially widespread during the Middle Ages. Here it was treasured as a liturgical furniture piece. Since the 15th and 16th century the folding chair has mostly had arm and head rests. Of course, newer chairs which are often found in functions and events are also called folding chairs. In 1947, Fredric Arnold created the first aluminum folding chair with fabric strapping for the seat and back. By 1957, the Fredric Arnold Company of Brooklyn, New York, was manufacturing more than 14,000 chairs per day. Today, the folding chair is mostly made of hard plastic or metal or wood. Folding chairs can be divided into different categories. Folding chairs typically weigh between 2 to 5 kilos (five to ten pounds) and are produced in a variety of styles, folding mechanisms, and materials. Most folding chairs pivot at the seat level. The seat aligns between the back supports. The back support and the front legs are the same part. There are, however, several designs that fold under the seat. Side-X stools consist if two X-shaped pieces with a sheet of cloth between them that becomes the seat. Front-X chairs are similar to side-X stools, but have the addition of a backrest. Side-X chairs are unique because the support for the backrest and front foot is the same part. The seat is collapsed to align between the sidebars, either down between the front legs, or up to align between back-sidebars. Mechanisms vary, but the supports for the back and the front feet are invariably the same part. .
Folding chairs in this category are extremely few and are sold in a very small volume. They cost from 150 to 300 dollars a piece. They may be upholstered, but often they are priced higher because they are associated with a renowned manufacturer.